Halloween is on its way, and nothing helps you say hello to the holiday better than some spooky snacks and meals to get you in the mood! These jack-o-lantern stuffed peppers are perfectly in character for chills and thrills — plus, they’re pretty tasty. Here’s how to make your own Halloween-themed peppers to prepare for trick-or-treat night. 1. Begin by preheating your oven to 350°F. Using a sharp knife, horizontally slice off the top of each pepper. Set aside the tops and remove all the membranes and seeds inside the peppers. Rinse the pitted peppers and pat them dry, then use a small paring knife to cut out little triangle eyes and a mouth for your jack-o-lantern face. 2. Cook your rice according to package directions in a pot of water on the stove. While the rice cooks, lightly grease a cooking pan with olive oil or cooking spray. Place peppers and tops of peppers on the pan and cook in preheated oven for 20 to 25 minutes until cooked but firm. Remove and let cool while you prepare the pepper filling. 3. In a skillet over medium heat, add a tablespoon of olive oil and saute your mushrooms and onions for three to four minutes until they have softened. Increase the heat to medium-high, add your sausage meat, red pepper flakes, Italian seasoning, salt and pepper and cook until sausage is browned and no pink remains, breaking up the meat and stirring occasionally. 4. Reduce heat to medium-low and add roasted red pepper sauce and rice, stirring to incorporate and cooking for an additional two to three minutes until warmed through. 5. 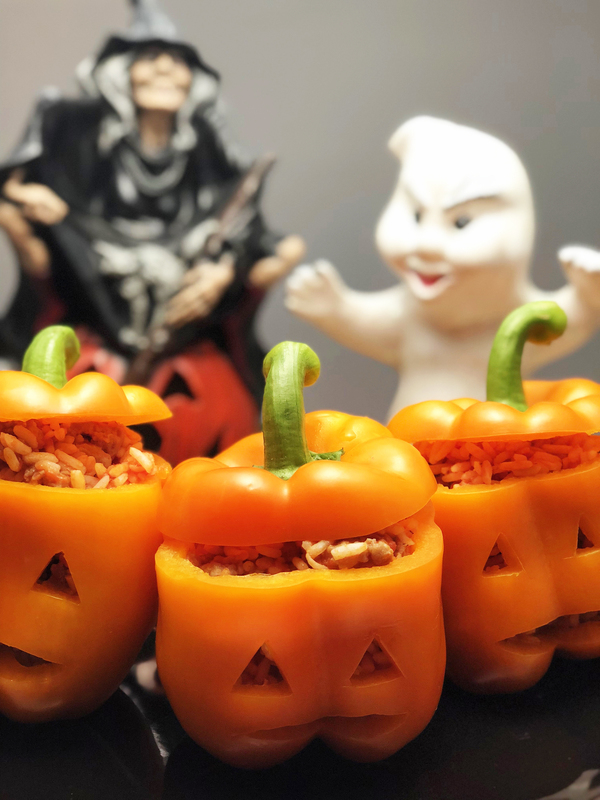 Fill each jack-o-lantern pepper with about a cup of the rice and meat mixture, filling a bit over the brim of each pepper and placing the pepper tops back on top to create your tasty, tempting jack-o-lantern treat. Enjoy! Crazy for our Premio Sweet Italian Sausage meat? Try all our sausage varieties in your kitchen and your dishes. Search for Premio products in a store near you.